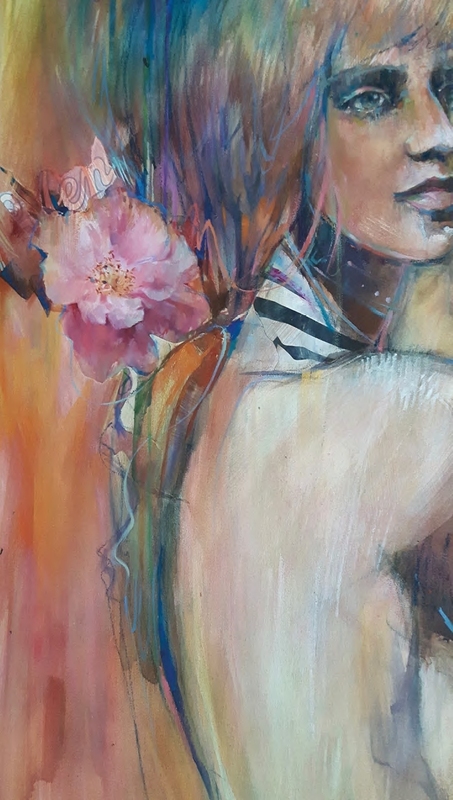 Detail from Pink Flower Girl, Rive Gauche Fine Oil Colours and mixed media on wood, 32x24in. (81x61cm). Here I wanted to work with pastel shades, and pink in particular. It is always interesting to see what a colour looks like when white is added. A perfect opportunity presented itself in the shape of this flower. The flower is part of this mixedmedia painting, which had to be painted on wood that was primed with gesso. I included the copper in my mixes to see what else this iridescent colour could do. The techniques applied to the flower were dry brush and careful painting with premixed shades (with a little extra linseed oil). I was able to mix the most beautiful colours, ranging from the deeper purple-pinks – the phthalo turquoise really stood out here – to the warmer pinks where yellow ochre, copper and orange played a role. I don’t usually use such an expansive palette, but what a great opportunity to compare so many variations. 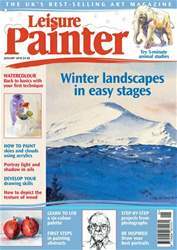 Welcome to a new year of painting with Leisure Painter. We begin this month's tutorials with David Webb's new year-long series, Watercolour basics and beyond, where he takes you through essential watercolour techniques. This month, David discusses basic equipment and the first of the techniques: the wash. For all those who want a back-to-basics approach to drawing and painting, we have step-by-step demonstrations, illustrated techniques and practical advice in watercolour, acrylics and oils as well as drawing media. For those with more experience, you will find plenty of inspiration and practical instruction for painting portraits, landscapes, animals, still lifes, abstracts, a market scene and more. We're here to help you make the most of your favourite hobby.